The project summary of the US Army's 1959 plan to place a military base on the moon by 1965! 1. (U) Reference letter to Chief of Ordnance from Chief of Research and Development, subject as above. 2. � Subsequent to approval by the Chief of Staff of reference, representatives of the Army Ballistic Missile Agency indicated that supplementary guidance would be required concerning the scope of the preliminary investigation specified in the reference. In particular these representatives requested guidance concerning the source of funds required to conduct the investigation. 3. (S) I envision expeditious development of the proposal to establish a lunar outpost to be of critical importance to the U. S. Army of the future. This evaluation is apparently shared by the Chief of Staff in view of his expeditious approval and enthusiastic endorsement of initiation of the study. Therefore, the detail to be covered by the investigation and the subsequent plan should be as complete as is feasible in the time limits allowed and within the funds currently available within the office of the Chief of Ordnance. In this time of limited budget, additional monies are unavailable. Current programs have been scrutinized rigidly and identifiable "fat" trimmed away. Thus high study costs are prohibitive at this time. 4. � I leave it to your discretion to determine the source and the amount of money to be devoted to this purpose. 5. Your plan of accomplishment should include full utilization of the other technical services and combat arms to the extent feasible and necessary. In the accomplishment of this investigation the Chief of Engineers all be responsible for the design, constriction, and maintenance of the base and the Chief Signal Officer will be responsible for communications and other support for which he is peculiarly qualified. Specific emphasis should be given to the Army-wide capability to contribute to this project. The results of this preliminary investigation are requested by 15 May 1959. 6. Reproductions of this letter to the extent you deem essential is authorized. All copies will be recorded. There is a requirement for a manned military outpost on the moon. The lunar outpost is required to develop and protect potential United States interests on the moon; to develop techniques in moon-based surveillance of the earth and space, in communications relay, and in operations on the surface of the moon; to serve as a base for exploration of the moon, for further exploration into space and for military operations on the moon if required; and to support scientific investigations on the moon. Initially the outpost will be of sufficient size and contain sufficient equipment to permit the survival and moderate constructive activity of a minimum number of porsonne1 (about 10 - 20) on a sustained basis. It must be designed for expansion of facilities, resupply, and rotation of personnel to ensure maximum extension of sustained occupancy. It should be designed to be self-sufficient for as long as possible without outside support. In the location and design of the base, consideration will be given to operation of a triangulation station of a moon-to-earth base line space surveillance system, facilitating communications with and observation of the earth, facilitating travel between the moon and the earth, exploration of the moon and further explorations of space, and to the defense of the base against attack if required. The primary objective is to establish the first permanent manned installation on the moon. Incidental to this mission drill be the investigation of the scientific, commercial, and military potential of the moon. NSC policy on outer space. OCB Operations Plan on Outer Space. The national policy on outer space includes the objective of development and exploiting US outer space capabilities as needed to achieve scientific, military, and potential purposes. The OCB Operations Plan to implement this policy establishes a specific program to obtain scientific data on space environment out to the vicinity of the moon, including the moon's gravitational and magnetic fields and to explore the characteristics of the moon's surface. There are no known technica1 barriers to the establishment of a manned installation on the moon. The establishment of a manned base of operations on the moon has tremendous military and scientific potential. Because invaluable scientific, military, and political prestige will come to the nation that first establishes a lunar base, it is imperative that the United States be first. The full extent of the military potential cannot be predicted, but it is probable that observation of the earth and space vehicles from the moon will prove to be highly advantageous. By using a moon-to- earth base line, space surveillance by triangulation promises great range and accuracy. The presently contemplated earth-based tracking., and control network will be inadequate for the deep space operations contemplated. Military communications may be greatly improved by the use of a moon-based relay station. The employment of moon-based weapons systems against earth or space targets may prove to be feasible and desirable. Moon-based military power will be a strong deterrent to war because of the extreme difficulty, from the enemy point of view, of eliminating our ability to retaliate. Any military operations on the moon will be difficult to counter by the enemy because of the difficulty of his reaching the moon, if our forces arc already present and have means of countering a landing or of neutralizing any hostile forces that have landed. The situation is reversed if hostile forces are permitted to arrive first. They can militarily counter our landings and attempt to deny us politically the use of their property. The scientific advantages are equally difficult to predict but are highly promising. Study of the universe, of the moon, and of the space environment will all be aided by scientific effort on the moon. Perhaps the most promising scientific advantage is the usefulness of a moon base for further explorations into space. Materials on the moon itself may prove to be valuable and commercially exploitable. 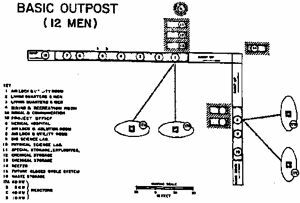 The establishment of the outpost should be a special project having authority and priority similar to the Manhattan Project in World War II. Once established, the lunar base will be operated under the control of a unified space command. Space, or certainly that portion of outer space encompassing the earth and the moon, will be considered a military theatre. The control of all United States military forces by unified commands is already established and military operations in space should be no exception. A unified space command should control and utilize, besides the lunar base, operationa1 military satellites and space vehicles, space surveillance systems, and the logistical support thereof. Other space commands might be organised as our operations extended to translunar space. To be second to the Soviet Union in establishing an outpost on the moon would be disastrous to our nation's prestige and in turn to our democratic philosophy. Although it is contrary to United States policy, the Soviet Union in establishing the first permanent base, may claim the moon or critical areas thereof for its own. Then a subsequent attempt to establish an outpost by the United States might be considered and propagandized as a hostile act. The Soviet Union in propaganda broadcasts has announced the 50th anniversary of the present government (1967) will be celebrated by Soviet citizens on the moon. The National Space policy intelligence estimate is that the Soviets could land on the moon by 1968. 6. Maintenance and Supply Implications. The maintenance and supply effort to support a lunar base will be high by present standards. Continued delivery of equipment and means of survival will be required and each delivery will be costly. Every conceivable solution for minimizing the logistic effort must be explored. Maximum use of any oxygen or power source on the moon through regenerative or other techniques must be exploited. Means of returning safely to earth must be available to the occupants of the outpost. 7. Training and Personnel Implications. The number of personnel on the base itself trill be quite small, at least initially, but the total number of personnel supporting the effort may be quite large. Until further study is made a realistic qualitative and quantitative personnel estimate cannot be provided. The training requirements of earth-based support personnel would resemble those of personnel in long range ballistic missile units and radar tracking systems. For the relatively small number of personnel actually transported to the moon base training requirements would be exacting in many fields. 8. Additional Items and Requirements. A complete family of requirements and supporting research and development projects will be necessary to develop all of the supporting equipment to establish a lunar base. Very high thrust boosters, space vehicles, intermediate space stations, space dwellings, clothing and consumable supplies will have to be developed. HORIZON is the project whose objective is the establishment of a lunar outpost by the United States. This study was directed by letter dated 20 March 1959, from the Chief of R&D, Department of the Army, to the Chief of Ordnance. Responsibility for the preparation of the study was subsequently assigned to the Commanding General, Army Ordnance Missile Command. Elements of all Technical Services of the Army participated in the investigation. This report is a limited feasibility study which investigates the methods and means of accomplishing this objective and the purposes it will serve. It also considers the substantial political, scientific and security implications which the prompt establishment of a lunar outpost will have for the United States. The US national policy on space includes the objective of developing and exploiting this nation's space capability as necessary to achieve national political, scientific, and security objectives. The establishment of a manned outpost in the lunar environment will demonstrate United States leadership in space. It will also provide a basis for further explorations and operations on the lunar surface as well as a supporting capability for other US operations in space. Advances in propulsion, electronics, space medicine and other astronautical sciences are taking place at an explosive rate. As recently as 1949, the first penetration of space war accomplished by the US when a two-stage V-2 rocket reached the then unbelievable altitude of 250 miles. In 1957, the Soviet Union placed the first man-made satellite in orbit. Since early l958, when the first US earth satellite was launched, both the US and USSR have launched additional satellites, moon probes, and successfully recovered animals sent into space in missiles. 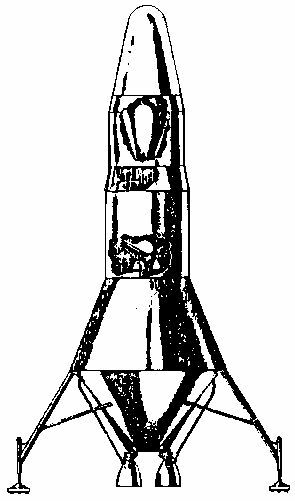 In 1960, and thereafter, there will be other deep space probes by the US and the USSR, with the US planning to place the first man into space with a REDSTONE missile, followed in 1961 with the first man in orbit. However, the Soviets could very well place a man in space before we do. In addition, instrumented lunar landings probably will be accomplished by 1964 by both the United States and the USSR. 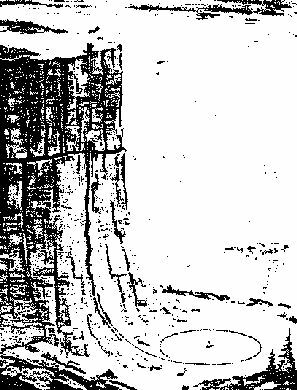 As will be indicated in the technical discussions of this report, the first US manned lunar landing could be accomplished by 1965. Thus, it appears that the establishment of an outpost on the moon is a capability which can be accomplished. A wealth of scientific data can be obtained from experiments conducted at a lunar outpost. Without doubt, the scientific community will generate many new and unique applications as man's actual arrival on the moon draws nearer reality. The very absence of knowledge about the moon and outer space is scientific justification to attempt to breach this void of human understanding. It is to be expected that civilian efforts to advance science for the sake of science will parallel the military efforts. It is also expected that the National Aeronautics and Space Administration will treat those subjects in greater detail than is either possible or desirable in this study, and that such action will further strengthen the requirement for the earliest possible establishment of an extraterrestrial outpost. The political implications of our failure to be first in space are a matter of public record. This failure has reflected adversely on United States scientific and political leadership. To some extent we have recovered the loss. However, once having been second best in the eyes of the world's population, we are not now in a position to afford being second on any other major step in space. However, the political implications of being second in space activities accomplished to date have not been nearly as serious as those which could result from failure to be the first in establishing a manned lunar outpost. The results of failure to first place man on an extra-terrestrial base will raise grave political questions and at the same time lower US prestige and influence. The Soviet Union has announced openly its intention that some of its citizens will celebrate the 50th anniversary of the October Revolution (1967) on the moon. The US intelligence community agrees that the Soviet Union may accomplish a manned lunar landing at any time after 1965. Judging from past experience, it is not difficult to visualize all manner of political and legal implications which the Soviet Union might postulate as a result of such a successful accomplishment nor the military advantages it might achieve thereby. The extent to which future operations might be conducted in space, to include the land mass of the moon or perhaps other planets, is of such a magnitude as to almost defy the imagination. In both Congressional and military examination of the problem, it is generally agreed that the interactions of space and terrestrial war are so great as to generate radically new concepts. Admittedly, the security significance of the moon, per se, in the context of offensive and defensive operations, is a matter for conjecture at this time. From the viewpoint of national security, the primary implications of the feasibility of establishing a lunar outpost is the importance of being first. Clearly the US would not be in a position to exercise an option between peaceful and military applications unless we are first. In short, the establishment of the initial lunar outpost is the first definitive step in exercising our options. Unquestionably, there are other applications of space (i. E. reconnaissance, meteorology, communications) which will permit an earlier attainment of meaningful accomplishments and demonstrate US interest in space. Individually, however, these accomplishments will not have the same political impact that a manned lunar outpost could have on the world. In the still vague body of fact and thought on the subject, world opinion may view the other applications similar to action on the high seas, but will view the establishment of a first lunar outpost as similar to proprietary rights derived from first occupancy. As the Congress has noted, we are caught in a stream in which we have no choice but to proceed. Our success depends on the decisiveness with which we exercise our current options. The lunar outpost is the most immediate case. It is the basis for other more far-reaching actions, such as further interplanetary exploration. Political, scientific, and security considerations indicate that it is imperative for the United States to establish a lunar outpost at the earliest practicable date. 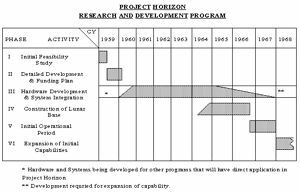 Project HORIZON represents the earliest feasible capability for the U. S. to establish a lunar outpost. By its implementation, the United States can establish an operational lunar outpost by late 1966, with the initial manned landings to have taken place in the spring of 1965. The program's ultimate accomplishment will be delayed, thus forfeiting the change of defeating the USSR in a race which is already openly recognized as such throughout the world. Delayed initiation, followed later by a crash program, which would likely be precipitated by evidence of substantial Soviet progress in a lunar outpost program, will not only lose the advantage of timeliness but also will inevitably involve significantly higher costs and lower reliability. The establishment of a U. S. lunar outpost will require very substantial funding whether it is undertaken now or ten years hence. There are no developments projected for the predictable future which will provide order of magnitude type price reductions. The U. S. Army possesses the capability of making significant contributions in all aspects of such a program. Volume II - Technical Considerations and Plans. Volume I is, as indicated, a document which gives a short summary of the other volume, a discussion of non-technical considerations, and a resume of the resources and facilities of the Army Technical Services which can lend support to this program. Volume II is a technical investigation of the problem. It includes practical preliminary concepts for all elements of the program and. In many cases, relates actual hardware available from current programs to the solution of specific problems. It includes a broad development approach and a funding breakout by fiscal year. Also included are personnel and training requirements for all segments of the operation together with the policy of the US with respect to space and the legal implication of a lunar outpost. This volume was prepared by a unique working group, comprised of a special segment of the Future Projects Design Branch of the Army Ballistic Missile Agency (ABMA), which was augmented by highly qualified representatives of each of the eleven Technical Services of the Army. These representatives were carefully selected for the specific task and, during the course of the study, became resident members of the aforementioned ABMA group. The resident representatives or the Technical Services were supported by their respective services with a group of the highest caliber specialists who were made available exclusively to support the project. Thus, it is believed that the depth of experience, knowledge, and judgment brought to bear on the problem by this group is commensurate with the task of accomplishing the report objectives. Throughout the preparation of the entire report, and especially within this technical volume, the guiding philosophy has been one of enlightened conservatism of technical approach. Briefly stated, this philosophy dictates that one must vigorously pursue research to "advance the state-of-the-art? ', but that paramount to successful major systems design is a conservative approach which requires that no item be more "advanced" than required to do the job. It recognizes that an unsophisticated success is of vastly greater importance than a series of advanced and highly sophisticated failures that "almost worked. " Established engineering principals, used in conjunction with the best available design parameters, have been applied throughout in order to remove the elements of science fiction and unrealistic planning. This part of the study presents applicable technical information which substantiates the feasibility of the expedited establishment of a lunar outpost, and it relates U. S. capabilities and developments to the accomplishment of the task It is comprehensive in its scope, covering the design criteria and requirements for all major elements of the program including the lunar outpost, the earth-lunar transportation system, the necessary communications systems and the considerable earth support facilities and their operation. The technical assumptions concerning design parameters for this program are realistic yet conservative. Likewise, the assumptions which concern the scope and magnitude of other U. S. programs which will support HORIZON are reasonable and in line with current and projected programs. The basic carrier vehicles for Project HORIZON will be the SATURN I and II. The SATURN I, currently being developed under an ARPA order, will be fully operational by October 1963. The SATURN II, which is an outgrowth of the SATURN I program, could be developed during the period 1962-1964. The SATURN II will utilize improved engines in the booster and oxygen/hydrogen engines in all of its upper stages. By the end of 1964, a total of 72 SATURN vehicles should have been launched in U. S. programs, of which 40 are expected to contribute to the accomplishment of HORIZON. Cargo delivery to the moon begins in January 1965. The first manned landing by two men will be made in April 1965. The build-up and construction phase will be continued without interruption until the outpost is ready for beneficial occupancy and is manned by a task force of 12 men in November 1966. The total cost of the eight and one-half year program presented in this study is estimated to be six billion dollars. This is an average of approximately $700 million per year. These figured are a valid appraisal, and, while preliminary, they represent the best estimates of experienced, non-commercial, agencies of the government. Substantial funding is undeniably required for the establishment of a U. S. lunar outpost; however, the implications of the future importance of such an operation should be compared to the fact that the average annual funding required for Project HORIZON would be less than two percent of the current annual defense budget. The lunar outpost proposed for Project HORIZON is a permanent facility capable of supporting a complement of 12 men engaged in a continuing operation The design of the outpost installation herein is based on realistic requirements and capabilities, and is not an attempt to project so far into the future as to lose reality. The result has been a functional and reliable approach upon which men can stake their lives with confidence of survival. The exact location of the outpost site cannot be determined until an exploratory probe and mapping program has been completed. However, for a number of technical reasons, such as temperature and rocket vehicle energy requirements, the area bounded by +-20 deg latitude/longitude of the optical center of the moon seems favorable. 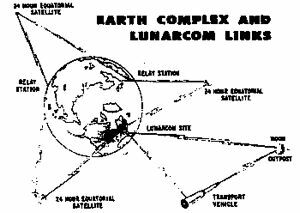 Within this area, three particular sites have been chosen which appear to meet the more detailed requirements of landing space, surface conditions, communications, and proximity to varied lunar "terrain". A rather extensive lunar mapping program is already underway in order to satisfy existing requirements in Astro-Geodesy. 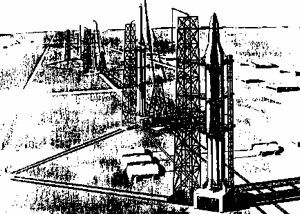 Maps to a scale of 1:5,000,000 and 1:1,000,000 are planned for completion by December 1960 and August 1962, respectively. Larger scale mapping will then be undertaken for several specific site selections. Surface gravity approximately 1/6 earth gravity. Surface temperature variations between it lunar day and night of + 248 deg F to - 202 deg F.
Maximum subsurface temperature at equator is -40 deg F.
These and many other unfamiliar environmental conditions require that every single item which is to be placed on the lunar surface have a design which is compatible with these phenomena. However, a careful determination has been made of man's requirements to live in this environment, and it appears that there is no area which cannot be adequately solved within the readily available state-of-the-art. The first two men will arrive on the lunar surface in April 1965. They will be guided to an area in which the cargo build-up for future construction has already begun. Their landing vehicle will have an immediate return-to-earth capability; however, it is intended that they remain in the area until after the arrival of the advance party of the construction crew. During their stay, they will live in the cabin of their lunar vehicle which will be provided with necessary life essentials and power supplies. For an extended stay, these will be augmented by support from cargo previously and subsequently delivered to the site by other vehicles. The mission of the original two men will be primarily one of verification of previous unmanned environmental investigations and confirmation of the site selection and cargo delivery. During the construction period, this force will be gradually augmented until a final complement of 12 men is reached. The construction camp is a minimum facility and will be made operational within 15 days after the beginning of active work at the outpost site. Two nuclear reactors are located in holes as shown in the left portion of Fig. I-1. These provide power for the operation of the preliminary quarters and for the equipment used in the construction of the permanent facility. 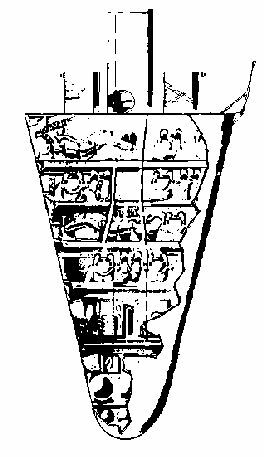 The main quarters and supporting facilities are shown being assembled in the open excavation to the right-center of the figure. These cylinders will also ultimately be covered with lunar material. Empty cargo and propellant containers have been assembled and are being used for storage of bulk supplies, weapons, and life essentials such as insulated oxygen/nitrogen tanks. Two typical surface vehicles are shown: one is a construction vehicle for lifting, digging, scraping, etc. ; the other is a transport vehicle for more extended distance trips needed for hauling, reconnaissance, rescue, and the like. In the left background, a lunar landing vehicle is settling on the surface. A lightweight parabolic antenna has been erected near the main quarters to provide communications with earth. The basic completed outpost is shown in Fig, I-4. Significant additions beyond the items illustrated in Fig. I-1 are two additional nuclear power supplies, cold storage facility, and the conversion of the original construction camp quarters to a bio-science and physics-science laboratory. A number of factors influenced the decision to locate the main structures beneath the surface. 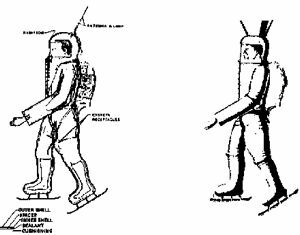 Among these were the uniform temperature available (approximately -40 deg F), protection from meteoroids, security, good insulating properties of the lunar material, and radiation protection. 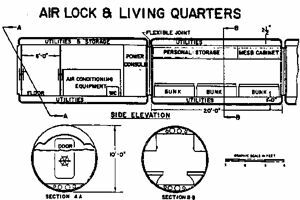 Each of the quarters and cylinders will be a special double-walled "thermos bottle type" vacuum tank with a special insulating material in the space between the walls. (Vacuum is usually maintained simply by venting the tank to the lunar void. ) Despite the ambient subsurface temperature of -40 deg F, the heat losses from these special tanks will be remarkably low. Investigations show that the incidental heat given off by an adequate internal lighting system will nominally supply essentially all of the heat required to maintain comfortable "room" temperature in the outpost quarters. A suitable atmosphere will be provided within the quarters. The basic gas supply will stem from special insulated tanks containing liquid oxygen or nitrogen The nitrogen supply needs only to provide for initial pressurization and replacement of leakage losses; whereas, the oxygen is, of course, continuously used to supply bodily needs. However, the weights and volumes of both gases are quite reasonable and present no unusual problem of supply. Carbon dioxide and moisture will be controlled initially by a solid chemical absorbent and dehumidifier. Such a scheme requires considerable amounts of material; therefore, a carbon dioxide freeze-out system will be installed later. A comprehensive program will be undertaken to provide special hand tools, load-handling gear, and dining equipment to meet the unusual requirements. Initially, all food will be pre-cooked; however, as water supplies increase with the introduction of a reclaiming system, dehydrated and fresh-frozen foods will be used., Early attention will be given to hydroponics culture of salads and the development of other closed-cycle food product systems. In order to corroborate essential environmental data, a series of unmanned experiments are planned. There are early data requirements in the areas of radiation, meteoroid impacts, temperatures, magnetic field, surface conditions, ionization, radio propagation and biological effects. In choosing appropriate trajectories to use in this program, one must strike a balance between the low-energy paths and the high energy curves. The low energy trajectories give the highest payload capability, but are sensitive to small variations in the injection conditions and can also lead to unacceptably long transit times. The higher energy trajectories are faster and are not as sensitive to deviations in the injection conditions, but they result in payload penalties and higher terminal velocities which in turn require greater braking energy at the termination of the trip. A good compromise appears to be a trajectory which will yield a transit time from earth to moon of approximately 50 to 60 hours. Several different trajectory schemes will be used in Project HORIZON. They include trajectories for transit: (1) direct from the earth to the moon, (2) direct from earth to a 96-minute (307 nautical mile altitude) orbit of the earth, (3) from this 96-minute earth orbit to the moon, and (4) direct from the moon to earth. In addition, there are special considerations for the terminal phase of each type trajectory. 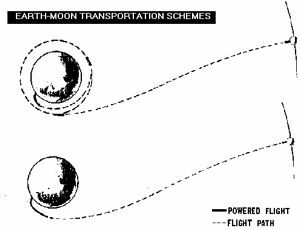 Figure I-6 illustrates the two basic schemes of transporting man and cargo from earth to the moon. The first scheme (1 above) is the direct approach, that is, a vehicle would depart the earth's surface and proceed directly to the lunar surface using a retro-rocket or landing stage for the final landing maneuver. Since the moon has no appreciable atmosphere, a rocket type propulsion system will be required for the landing. The second scheme (2 and 3 above) shown is that for proceeding first into an earth orbit and later departing the orbit for the flight to the lunar surface, again using a landing stage. In either scheme, the flight time from the earth or earth orbit to the moon will be the same. The direct scheme, which is the most straightforward, has two advantages: first, it offered the shortest flight time from the earth's surface to the lunar surface since an orbital stopover is not required. In the orbital scheme, much larger payloads can be transported into orbit, assuming the vehicle size to be constant, and by accumulating payloads in orbit, it is possible to transport a payload to the moon on the order of ten times (and more if desired) the capability of a single vehicle flying directly to the moon. To illustrate this point, it has been assumed in the study that the. First men arriving on the moon will be provided with an immediate return capability. Figure I-7 depicts the vehicular requirements for the two schemes. The direct approach would require a six stage vehicle with a lift-off thrust of 12 million pounds, as compared to a two-million-pound thrust vehicle for the orbital schemes. 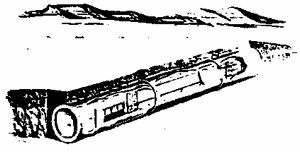 By placing the upper stage and payload of two-million-pound thrust vehicle into orbit, and with additional vehicles as shown, performing a fuel transfer and checkout operation, the same mission, that of transporting two men to the moon and returning them to earth, could be accomplished. It should be pointed out, however, that if the United States is to have a manned lunar outpost by 1966, and at the same time provide the first men arriving on the moon with the desired return capability, the orbital approach is mandatory, since a 12-million pound thrust vehicle will not be available to meet the required schedule. For the return to earth, from either the earth orbit or the lunar surface, aerodynamic braking will be used, since it allows significant overall payload increases when compared to rocket braking. The aerodynamic braking body used for this study is similar in shape to a JUPITER missile nose cone modified by the addition of movable drag vanes at the base of the cone. Though the size varies, the same basic shape was considered for use from the lunar surface to earth act as for use from the 96-minute orbit to the earth's surface. Studies show that, within acceptable limits of entry angle, the vehicle can make a successful descent which is well within the physical tolerances imposed by man's presence, and which can be guided with acceptable accuracy for final recovery. The recent successful flight and subsequent recovery of two primates aboard a nose cone further substantiates the validity of this approach to earth return braking. This test vehicle was fired to IRBM range and, due to the steep re-entry angle, the decelerative forces r� associated with this operation were many times greater than expected for project HORIZON trajectories. Only two basic carrier vehicles are required to carry out Project HORIZON - SATURN I and a further development, SATURN II. The SATURN I vehicle, shown in Figs. I-8 and I-9 consists of a clustered booster with a lift-off thrust of 1,504, 000 pounds, a twin engine second stage of about 360,000 pounds of thrust, and a lox / hydrogen (O2/H2) third stage of 30,000 pounds of thrust. The initial performance of this vehicle will enable it to place 30,000 pounds of net payload in a 96-minute orbit and 7,500 pounds of net payload to earth escape velocity. It will be powered by eight North American H-l engines which are a greatly simplified version of the engine used in JUPITER, THOR, and ATLAS. The second stage is a modified version of the TITAN booster. The third stage is a modified CENTAUR vehicle currently under development by Pratt & Whitney and Convair. The SATURN II vehicle (Fig. 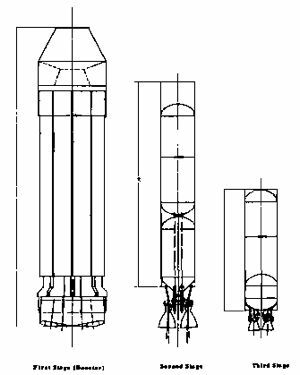 I-10 and I-11) is based on a modified SATURN I booster. The North American H-1 engines of the original version will be replaced by H-2 engines which will up-rate the total thrust by 1/3 to a sea level value of 2,000,000 pounds. The second stage will incorporate two 500,000-pound thrust O2/H2 engines, a third stage will utilize two 100,000-pound thrust O2/H2 engines, a fourth stage will use one such engine. 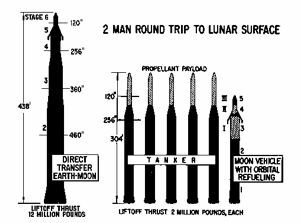 Present feasibility studies indicate a SATURN II payload capability of 70,000 pounds into a 96minute orbit using three stages and 26,750 pounds to earth escape velocity using four stages. The development of such a vehicle will provide the nation a near-optimum vehicle for the utilization of the SATURN booster. The prime requirement for the development of such a vehicle is an expansion of current high-energy O2/H2 engine programs to include development of 100 K and 500 K engines. 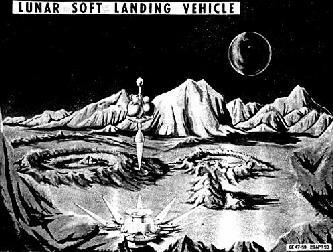 As mentioned earlier, 6,000 pounds of useful cargo can be soft-landed on the moon with the direct method. 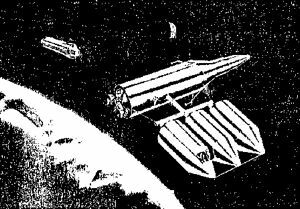 As presented herein, only cargo will be transported in this manner, although there is a discussion of how personnel could also be transported to and from the moon utilizing the direct method. The second form of conveyance requires two steps. Initially the required payloads, which will consist of one main lunar rocket vehicle and several additional propellant tankers, will be placed in a 96-minute orbit of the earth. At this time, the propellants in orbit will be transferred to the main lunar rocket vehicle. Figure I-12 is a conceptual view of the operations in the equatorial earth orbit. The operation in orbit is principally one of propellant transfer and is not as assembly job. The vehicle being fuelled is the third stage of a SATURN II with a lunar landing and return vehicle attached. 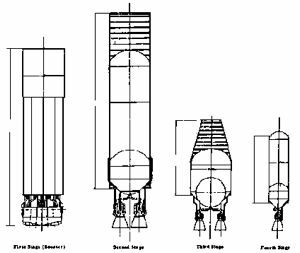 The third stage of the SATURN II was used in bringing the combination into orbit and has thus expended its propellants. This stage is fuelled in orbit by a crew of approximately ten men after which the vehicle then proceeds on to the moon. It is planned to send all personnel and approximately 1/3 of the cargo to the moon by the orbital method. Using this orbital system, individual payloads of 48,000 pounds may be soft-landed on the moon. This value is especially significant, since it represents the approximate minimum weight required for a complete earth return vehicle, which is already assembled and loaded with propellants and is capable of returning several men. Thus, in order to provide a pre-assembled return vehicle on the lunar surface during the time frame under consideration, it is mandatory to go through an initial earth orbit. In addition to providing a large individual payload capability, the orbital transportation system offers other important advantages. Among these are that the total number of firings to deliver the same amount of payload to the moon is less and payloads may be fired for orbital rendezvous at any given pass every day of the month. 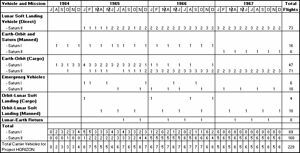 This alleviates the launch site scheduling problems which are associated with the restricted firing times of direct flights. There are two versions of the lunar landing vehicle. The first type will be used for direct trips from earth to the lunar surface. This vehicle has a gross weight of 26,150 pounds and will soft land some 6,000 pounds of payload. The second vehicle will be used for flights via orbit. It will have a gross weight of 140,000 pounds which gives it a capability of soft landing approximately 48,000 pounds of payload on the moon. Each type of vehicle will have suitable payload compartments to accomplish different mission requirements. The lunar landing vehicle shown in Fig. I-13 has an earth return vehicle as a payload. For such return vehicle payloads, the structure of the expended braking stage will serve as a launching platform when it is time to begin the return journey to earth. To sustain the orbital station crew and to provide for their safe return to earth, an orbital return vehicle such as shown in Fig. I-14 will be provided. This vehicle may be used in conjunction with another established United States orbital station, or it may be used as a basis for a minimum orbital station needed to support Project HORIZON. It is capable of carrying from 10 to 16 men. It will be carried into orbit by a SATURN I during the first part of the program and replaced by a SATURN II in 1967. An investigation of the guidance problems concerned with Project HORIZON indicates that the necessary accuracies and reliabilities can be met by adaptations, combination and slight extensions of known and available guidance hardware and techniques. Final injection velocity, which marks the beginning of the coast phase of the trajectory to the moon, will be controlled by conventional means. Mid-course guidance will assure that the lunar landing vehicle would come within approximately 20 km (11 nautical miles) of the selected point. The terminal guidance system, which would be target oriented, would reduce the three standard deviation error at landing to approximately 1.5 km. The development and integration of the space carriers to support HORIZON have been carefully outlined and various considerations as to compatibility, size, development schedule, and overall mission have been included and discussed in detail in Volume II. Personnel space transportation requirements to support HORIZON are shown on Pig. I-15. 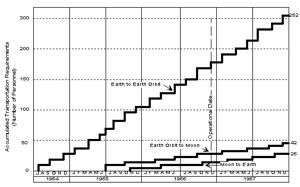 By the end of 1967 some 252 persons will have been transported into an earth orbit, 42 will have continued to the moon, and 26 will have returned from the moon. The orbital station strength is approximately ten; however, the crew will be rotated every several months. The space transportation system will deliver some 756, 000 pounds of useful cargo to the lunar surface by the end of 1967. In order to accomplish this, 229 SATURN vehicle firings will be required. A schedule of launching and the broad mission assigned each vehicle is shown in Fig. I-16. It should be noted that, due to the savings incurred by the booster recovery system which will be used, the total number of SATURN boosters required to support the program is not 229 but only 73. 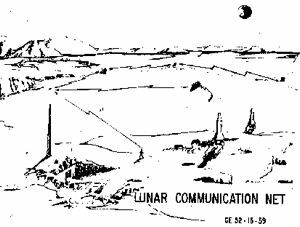 The communications required for Project HORIZON are logically divided into an earth-based and lunar-based complex. Each of these complexes may be considered as having two functions - communications and surveillance. Of particular significance for the earth-based complex is the 24-hour communications satellite system presently under development; As illustrated in Fig. I-17 such a system will provide the capability of constant communications with both space vehicles in transit and the lunar outpost. In addition to the 24-hour communications satellite system, the current development program of a world-wide surveillance net will provide space surveillance for the United States during the 1960 era. The basic hardware and techniques used in this net are directly applicable to HORIZON. Figure I-18 illustrates schematically how such a world net station could be expanded to support HORIZON by the addition of two additional 85-foot antennas and other equipment. Communications on the lunar surface will pose special problems due in a large part to the lack of atmosphere and the relatively high curvature of the surface. However, careful investigation reveals no problems which cannot be solved by an appropriate research program. In a number of areas, current developments appear almost directly applicable; for example, the small helmet-mounted radio currently in production and troop use. A micro-miniaturized version of this, presently in advanced development, will provide a basis for personal communication between individuals clad in lunar suits. As the lunar outpost expands, radio relay stations will extend the radio horizon as conceived in Figure 1-19. In addition to voice communication between members of the lunar party, a number of other electronic devices will be used at the outpost, These include TV receipt and transmission, transmission of still photographs, homing and location devices, instantaneous self-contained emergency communications packs (for distress signals to earth), infrared detectors, and radar detectors. A survey was made to determine the adequacy of the Atlantic Missile Range and Pacific Missile Range for the accomplishment of Project HORIZON. The results of this survey indicated that, all things being considered, neither site was suitable. Since a new launch site will be required, a study was made to determine the optimum location and requirements for such a site. The results of this study are discussed in detail in Volume II and illustrated in Fig. I-20. A total of eight launch pads are required. This facility will support the requirements of HORIZON and would also provide additional capacity for other United States programs. The equatorial location of the new launch site would provide very real advantages in terms of payload capability, guidance simplicity, and operational launching schedules in terms of increased latitude of appropriate firing times. Two sites stand out when compared to others: Brazil and Christmas Island. Both of these locations appear feasible; however, more detailed criteria will have to be established to make the best choice. Cost and early availability may ultimately be the governing factors. It is emphasized that site acquisition and initiation of launch site construction is one of the most critical items in the program with respect to lead-time. For the purposes of this study it has been assumed that the Brazil site would be used. The logistic support for Project HORIZON has been studied in overall scope as well as detailed investigations of specific areas such as manufacturing considerations, transportation considerations, personnel, and personnel training. The results of the studies show very clearly that military participation in the logistic portion for Project HORIZON is not only desirable, but mandatory. No attempt has been made to determine the level of military participation since such items as the world-wide political situation will play an important part in the ultimate decision. Phase I - The initial feasibility study was completed on 9 June 1959 and is contained in this two volume report. Phase II - The detailed development and funding plan will require a more detailed study with limited experimentation. This phase will require approximately eight months to complete and will cost $ 5.4 million. required to accomplish the project objectives will be developed. Phase IV - The construction of the lunar outpost involves the utilization of the systems and procedures developed in Phase III and is in actuality an operational phase of the program. The completion of this phase will accomplish the initial objective of the program: "establish a manned lunar outpost. " Phase V - The initial period of outpost operation will begin in December 1966 and will constitute the first completely operational phase of the program. Phase VI- The expansion of initial outpost operational capabilities could begin at any time after December 1966. For the purpose of this study it has been assumed to begin in January 1968. The importance of a strong basic and supporting research effort in support of a project of this nature cannot be overstated. Typical areas requiring attention are food and oxygen, clothing, chemical, biological, radiological bio-medical, vacuum conditions, weightlessness, meteoroids, lunar-based systems, moon mapping, explosives in lunar environment, power generation, material and lubricants, liquid hydrogen production and handling, and lunar "soil" mechanics. As mentioned above, a strong basic and supporting research program will be required to accomplish the HORIZON development program, and ultimately the project objectives. The development program for this project is basically covered by the first three phases of the project outlined above, the first of which has been completed. Phase II, the next step in the development program, must be accomplished in the time scale indicated in Fig. I-21 if the United States is to succeed in establishing the first lunar outpost. The development plan, generated in Phase II will spell out in considerable detail the developments required in Phase III, as well as requirements for later phases. Basically, Phase III will be the development portion of the project. During this phase, al1 development required to accomplish the project objectives will be satisfied. Several unique facilities will be required to support HORIZON. Figure I-22 is a view of a large lunar environmental simulator which will provide a capability for research, development, testing and training for HORIZON as well as other projects in the national space program. Figure 1-23 illustrates a space flight simulator which will provide for research and training of effects associated with boost acceleration, coasting, weightlessness, and braking deceleration. In addition, medical research facility is located in conjunction with this site. Project Horizon View of Flight Simulator - a combined high-G and zero-G sled running down the side of a cliff! Advanced (Nuclear?) 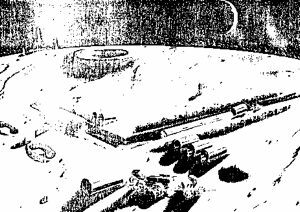 Lunar Landing Vehicle ascent stage departs from Moon as envisioned by Von Braun team in1959.